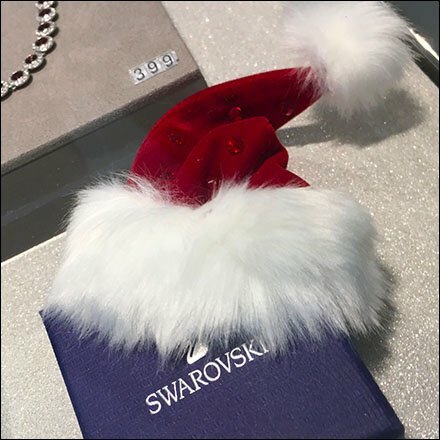 The only thing better than crystal as a present is crystal in a Swarovski Gift Box Christmas Cap. Now that is Holiday fun. Swarovski is available as jewelry, sculptures, pop art, and even Purse Charms. Stop by a store to see the styles of Gift Box presentation. This Swarovski seen at the King of Prussia Mall, Philadelphia, Pennsylvania. “Swarovski Retail Fixtures Pinterest Board“ for a visual summary.